WIGAN Athletic were involved in another five-goal thriller at London Road - and went away with all three points thanks to Max Power’s late winner. The visitors had looked home and hosed after dominating the opening hour and holding a thoroughly deserved two-goal advantage. Yanic Wildschut grabbed the opener on 11 minutes with a cool finish after a penetrating run through the Posh midfield. Three minutes later it was 2-0 after Reece James’ shot flicked off Will Grigg and past goalkeeper Ben Alnwick. But credit the home side for sticking at their task and, after Latics had failed to add a third goal, the game was turned on its head in the final third. First, Jussi Jaaskelainen couldn’t hold a shot from Jon Taylor and Erhun Oztumer fired home from close range on 62 minutes. Then, with 10 minutes to go, Posh took advantage of virtual one-way traffic to equalise through Souleymane Coulibaly. At this point, the home side had all the momentum and there looked only one winner. But, from the restart, Power found himself unmarked on the edge of the area, and he drilled into the bottom corner of the net to the delight of the 260 travelling fans from Wigan. 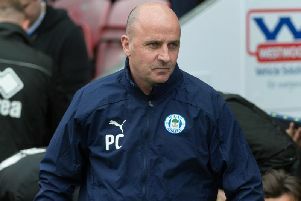 The result extends Wigan’s unbeaten run in all competitions to eight matches, and lifts them to within one point and one place of the play-off places. Latics had begun the night on the back foot, forced to stand firm after a confident start by the hosts. Jon Taylor was looking like the real dangerman for Peterborough, with one shot flying just past the post and another being blocked by Craig Morgan. But just as the hosts were turning the screw, Latics hit them with a classic counter-attack to take the lead. Wildschut it was who picked up the ball in the centre of midfield. The Dutchman pinned back his ears and embarked on a driving run through the heart of the defence. With three would-be tacklers in his wake, and Grigg calling for a pass on the right, Wildschut instead aimed for goal and saw his pinpoint effort beat Ben Alnwick. With their tails up, Latics flew forward in search of number two, and it nearly arrived within a minute as Power fizzed an effort just past the far post. But the respite for Posh was only temporary with Latics making it 2-0 on 14 minutes. Left wing-back James found himself in time and space inside the area, and his shot appeared to take a deflection off Grigg and into the net. Posh looked shell-shocked to be suddenly two goals behind, but they stayed positive and continued asking questions. Taylor shot just wide, with Gabriel Zakuani directing a header from a corner inches off the target. Wildschut was causing panic in the home defence every time he got the ball, gliding through effortlessly on one occasion only for his shot at the end to be disappointing. At the other end, Lee Angol headed straight at Jussi Jaaskelainen before Chris Forrester fired wide of the mark. Latics finished the half in the ascendancy, and Jacobs was only denied number three by a fantastic save from Alnwick. And as half-time approached, Grigg pulled another shot just past the post from a good position. Latics picked up where they left off after the break, with Jacobs firing over the top and seeing another effort superbly tipped round the post by Alnwick. A fine strike from Power fizzed just wide, with Posh holding on for dear life at this point. However, the hosts gave themselves a lifeline just after the hour mark when Jaaskelainen couldn’t hold the initial shot from Taylor and Oztumer followed in to thump it home. There followed a sustained period of pressure from the home side, with Latics now the side on the ropes and hanging on. Angol spooned a gilt-edged opportunity over the bar, and was only inches away from being on the end of a neat cross from Conor Washington. Jermaine Anderson also failed to finish off a decent opening, with Latics desperately trying to get the ball and keep it without much luck. The goal that had been coming finally arrived with 10 minutes left, Coulibaly scoring with his first touch to send the home fans into raptures. All the momentum was with Peterborough by this time, but there was to be a final sting in the tail - in the visitors’ favour. Latics immediately pressed from the restart, with the ball finding its way to Power on the edge of the area. The ex-Tranmere man composed himself before unleashing a deadly strike into the bottom corner to secure a precious three points for his side. Peterborough: Alnwick; Smith, Santos, Zakuani, Elder; Forrester, Oztumer, Bostwick; Washington, Taylor, Angol. Subs:Henry, Vassell (for Otzumer, 86), J Anderson (for Santos, 60), Fox, H Anderson, Coulibaly (for Smith, 79), Collison. Latics: Jaaskelainen; Barnett, Morgan, McCann; Daniels, Power, Perkins, James; Jacobs, Wildschut, Grigg. Subs: O’Donnell, Love, Chow (for Jacobs, 67), Cowie, Davies (for Wildschut, 76), Hiwula, Holt (for Grigg, 64)..